TOUR INFORMATION -- The Wyoming Historical Museum, located on the south side of Wyoming’s Main Street, is once again a tourist attraction in Eastern Jones County, Iowa. A devastating fire, in July of 2013, nearly claimed the large building that was built in 1878 from Wyoming’s native brick and known as The Williams Hotel. Little by little, the twenty rooms have been renovated and displays showing the history of the community have been created. Visitors may enter into the hotel lobby and continue into a charming parlor displaying an old pump organ from 1872, as well as a theatre model “Player Piano”. There is an old fashioned drugstore, complete with a soda fountain and an extensive display of pharmaceutical items. Also, on the main floor are many other antiques and a library area that features maps, atlases, and genealogy research. The full basement under the hotel contains interesting agricultural displays of years gone by. There is farming machinery, equipment for farm animals, as well as building and plumbing supplies dating back to the late 1800’s. Going upstairs, via the open staircase, tourists can view thirteen rooms – each one created with a special theme. The rooms consist of an old fashioned barbershop, dentist office, school room, hotel room, kitchen, clothing room, quilt room, and sports room featuring a display of Emil “Dutch” Levsen – a baseball player from Wyoming who pitched for the Cleveland Indians. In 1926, “Dutch” was the last person to pitch and win a double header in the Major Leagues. The ladies will enjoy the room of vintage household equipment as well as the sewing room that displays a collection of over thirty sewing machines. The arts and entertainment room, featuring a hand carved circus will interest the children, and they will also enjoy seeing the collections of arrowheads. The men can spend hours looking at the tool room that contains approximately 200 woodworking planes and tools. The 80 foot hallway is a popular attraction for those doing genealogical research. On display there are pictures of the Wyoming graduation classes. These date back to the late 1800’s. An extensive gun collection can be seen in the gun room. These guns date back into the 1700’s. Returning to the main floor, a guide will take visitors next door to the Post Office Annex. Here there are postal displays and ledgers dating back to the late 1800’s. The annex building also has military information, artifacts, and uniforms. Wyoming, Iowa was well represented in the Civil War as well as both World Wars and other conflicts. Also featured in the annex is a huge display from the Crescent Printing Company that was a Wyoming business for nearly 100 years. The large printing presses and equipment are on display. Railroad “buffs” will find interesting information and pictures of the railroad that was once a part of Wyoming. Although we do not have regular hours for tours, we will open at any time that a tour is desired. Just call one of the numbers on the poster page and set up your special tour time. R.S. WILLIAMS -- The Wyoming Historical Museum is housed in the “Williams Hotel” that was built by Royal Seneca Williams in 1878. “R.S. Williams”, as he was known, was born October 1, 1824 in Chesterfield, Massachusetts. He came to Wyoming, Iowa about 1860. On September 6, 1862, at the age of 38, R. S. Williams joined Company K of the 24th Regiment that was sworn in at Wyoming. He fought in the Union Army during the Civil War, and was wounded at Cedar Creek, VA. R.S. Williams mustered out of the army as a Full First Lieutenant on June 18, 1865. Returning to Wyoming, he and his wife Jennie raised four children, and he worked as a contractor, builder, and brick mason. R.S. Williams became the first successful brick maker in the area and had his own brick factory which was located in and around the parking lot of the present Lutheran Church. Brick was made from native clay found in the Wyoming area. Many of the brick buildings in Wyoming were built by R.S. Williams, including the large hotel located on Wyoming’s Main Street. The Williams Hotel has been the home of The Wyoming Historical Museum since 1988. 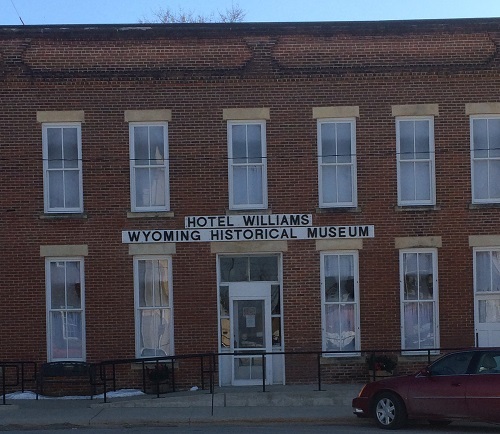 HISTORY – The Wyoming Historical Museum is located on the south side of Main Street in Wyoming, Iowa. The building was built by R.S. Williams in 1878 using brick from his factory located in Wyoming. It was operated as a hotel until 1932, when the upstairs was converted into apartments. The downstairs was then the home to many different businesses for fifty years. In 1987 when the town druggist, Marty Botkin, decided to retire – he said that he would like to give the contents of his drugstore to the town of Wyoming --- IF, there was a place to put them. The contents included a soda fountain and an extensive supply of pharmaceutical items. At this time, the Williams Hotel was in quite bad shape, and total destruction was threatening. A small group of dedicated residents saw the possibility of a museum and went to work. The outside work included replacing the roof and repairing the brick walls. This required salvaging and cleaning brick from homes in the area that were being demolished at the time. Many of the rooms used as apartments had deteriorated through the years. Rotten floors and walls were removed and renovation was well underway in 1987. One room was ready by September of 1988, and the Wyoming Historical Museum opened in November of that same year. Work has continued for 25 years, and the museum has expanded to use all twenty rooms in the Williams Hotel. Due to the common wall between the hotel and the old post office building (which was close to destruction) --- Moisture was coming through the wall into the hotel building. The museum commission purchased that building and started working. They replaced the roof and walls as a beginning, and have gradually replaced the floor using boards taken from a church that was demolished. The first floor of the old post office was nearly ready to become an annex for the museum, so new windows were installed. Painting was in process and success was in sight, when a fire next to the hotel building nearly destroyed everything that had been made possible through so much hard work. On July 21, 2013 – The Swinging Door Bar and Grill on the west side of the hotel building burned to the ground, and at one point it was thought that the whole block would go up in flame. Amazingly, not a single item from the museum was lost; however, everything sustained smoke or water damage. Three feet of water had to be pumped out of the basement, and the foundation was repaired. The walls and ceilings of all the rooms were then sealed and repainted. Many of the contents were boxed up and removed for cleaning; however, large items were cleaned on site. The volunteers of Wyoming were then faced with unpacking over 700 boxes, replacing contents in the twenty rooms, making new curtains for nearly thirty windows, doing a new inventory, and making new laminated labels to mark museum items for identification. The museum is now better than ever and open for tours.